Amazing!!! Isn’t it?? This is an important news for me. I have always dreamed of flying. I’ll someday achieve this dream. But it’ll take a long time. So till then my dreams are my companion and my inspiration. Let’s not talk about dreams. I’ll write in detail about that. 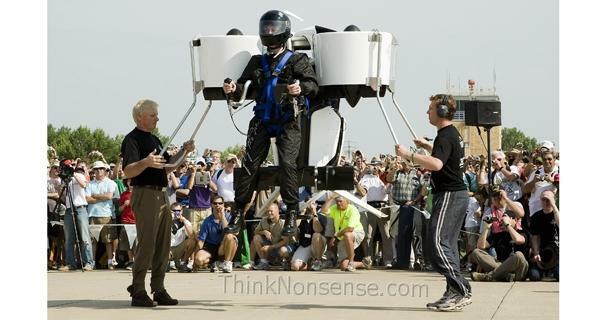 The Jetpack you see is invented by a New Zealand inventor Glenn Martin. The inventor worked very hard and spent many years on that machine. There are many advantages and disadvantages of this Jetpack. I’ll mention them further. It looks a lot different from what it is. The usage of this jetpack are endless. It surely provide good attention on safety. This product is still not final and is still in beta stages. My flying wish was lying dead somewhere. Now it’s time for that to wake up. Glenn already said that the size of the jetpack will decrease. So it’ll be compact and you can carry it life a small bag. The funny thing is it never flew over six feet. If asked Glenn says “If you can fly it at 3 feet, you can fly it at 3000 feet”. The engine is powered by whopping 200bhp motor. It should be very heavy. I was first fascinated by Jetpack way back in my high secondary. There were PC’s around and we used to play a game named “Dave”. Now don’t ask me if you haven’t heard of this game. It’s one of the great classics. There were many places in game where there were Jetpack. And the way I used to fly with Jetpack was awesome. It is much more lighter and compact than real Jetpack. If you have decided to buy this then you should know it’s price. It costs just around $$10000. Thanks for the information…. Nice post…. Surely i will try it once.. What about you? I’ll have to start saving from today. Just visited your blog and well now inviting you to my blogspot (www.ranjitzone.blogspot.com)and also to be my friend. HAPPY FRIENDSHIP DAY … ! Do Visit my Blog and send your comments..! Good morning. Humor is also a way of saying something serious. Waiting for a reply :P, Becca.